The 40th Toronto Film Festival, which kicks off Thursday, represents both what’s great and what’s maddening about the fall movie season. With the summer blockbusters behind us, we can focus more on serious, ambitious dramas—though some of those might turn out to be lame awards bait or pretentious misfires. Below are 10 films screening in Toronto that could help shape not just the Oscar race, but also critics’ best-of-the-year lists. (Though it’s important to remember that many films—including Steve Jobs, directed by Danny Boyle and starring Michael Fassbender—will play other fall festivals, but not this one.) My picks are all sight-unseen guesses—I’ve already checked out Spotlight and really dug it—but I’ve got high hopes for these especially. Oscar-winning screenwriter Charlie Kaufman has only directed one feature, 2008’s terrific, mind-altering Synecdoche, New York. His sophomore effort, which he co-directed with Duke Johnson, is a stop-motion romance based on his own play that follows a British motivational speaker (David Thewlis) who meets a woman (Jennifer Jason Leigh) in Cincinnati in the midst of a speaking tour. Anomalisa’s producers have tried to keep their plot points secret—even the promotional still is purposely opaque—and the initial glowing reviews have recommended going in as unaware as possible. That’s no problem: “Charlie Kaufman” and “stop-motion romance” were enough to get me in the door. One of the best things about director Cary Fukunaga’s career is that you’re never quite sure what he’ll do next. Coming to the world’s attention with 2009’s gritty immigrant tale Sin Nombre, he switched gears for his follow-up, the 2011 period adaptation of Jane Eyre with Mia Wasikowska and Michael Fassbender. After earning a lot of credit for the successful first season of True Detective, he now returns with his third feature, an African drama that seems tonally akin to Sin Nombre, adapting Uzodinma Iweala’s novel about a child soldier (first-timer Abraham Attah) taken under the wing of a frightening warrior (Idris Elba). For the industry, Beasts of No Nation is noteworthy because Netflix will be distributing the movie on its platform the same day it’s released theatrically; having already established itself as a major award-season force in television, the streaming service now wants to do the same in the film business. Still, I’m more interested in the fact that Beasts’ initial reviews have been very positive. At 85, Frederick Wiseman is both one of our oldest and among our very best documentary filmmakers. His recent efforts Boxing Gym, At Berkeley, and National Gallery were all terrific, and now he turns his attention to the Queens neighborhood of Jackson Heights. His movies are always deeply immersive portraits of communities—he doesn’t include talking-head interviews or voiceover narration, preferring that we just get absorbed into the daily rhythms of the worlds he’s chronicling. This time he focuses specifically on the neighborhood’s claim of being the most diverse in the world—reportedly, 167 languages are spoken there—so the result promises to be a snapshot of America’s melting pot in 2015. And because it’s a Wiseman documentary, it’s also epic in length: This one clocks in at 190 minutes. Between Straight Outta Compton, Jimi: All Is by My Side, Get on Up, and Love & Mercy, we’re living in a period of fascinating, risk-taking musical biopics. So fingers crossed for this one, which looks at the brief life of country legend Hank Williams, who didn’t make it to 30. Tom Hiddleston plays the lead and does all his own singing; Elizabeth Olsen costars as his first wife, Audrey. The festival description makes me a little worried that we’re in for a conventional warts-and-all biopic, but hopefully Hiddleston brings a little zest to it. Surprisingly, I haven’t seen this one mentioned in other Toronto previews. A glimpse at the doping scandal that torpedoed Lance Armstrong’s career and reputation, it’s directed by Stephen Frears, who with The Queen proved that he can turn recent history into smart, nuanced drama. But what most intrigues me here is that this is a quintessentially American tale being told by an English director and a Scottish screenwriter (John Hodge, who also adapted Trainspotting). Will an outsider’s perspective bring new insights? Underrated actor Ben Foster (The Messenger, 3:10 to Yuma) taking Armstrong’s role only sweetens the deal. The trailer’s a little dry, though. Emma Donoghue’s 2010 novel Room is the stuff of nightmares: A young boy and his mother are held captive for years, finally escaping into the outside world the child has never known. This film adaptation is directed by Lenny Abrahamson, who last made a very different portrait of mental trauma, the absurdist Michael Fassbender black comedy Frank. Also, will this finally be the breakout film for Brie Larson? She’s been great in everything from Short Term 12 to 21 Jump Street to The Spectacular Now to Trainwreck—plus, she was a regular on the Toni Collette TV series United States of Tara—and yet she still feels a bit underappreciated. (Maybe that’s because in the big movies she’s done, she’s been just a supporting player, while her starring role in Short Term 12 went mostly unseen.) Playing Ma could land Larson her first Oscar nomination. James Vanderbilt isn’t a household name, but he’s responsible for one of the sharpest screenplays of the last 10 years, 2007’s meticulous, obsessive Zodiac. He’s also got plenty of action-movie credits, from White House Down to The Amazing Spider-Man, but now he’s made his feature directorial debut, and it feels very akin to Zodiac’s fascinating, fact-based, journalistic drama. Truth looks back at the scandal that brought down Dan Rather’s career: In 2004, the veteran CBS anchor contended that President George W. Bush had received preferential treatment during the Vietnam War by serving in the Texas Air National Guard as a way to avoid being drafted. Robert Redford plays Rather, while Cate Blanchett is his 60 Minutes producer Mary Mapes. Will this be an exoneration, or a cautionary tale about investigative reporting gone wrong? Either way, with Redford as the star, the film can’t help but have the potential to be a latter-day All the President’s Men. When critic John Powers reviewed Bowling for Columbine back in 2002, he opened his piece with a definitive line about its maker: “One of the mosquito-bite irritations of being on the left is finding your ideals represented in public by Michael Moore.” The Oscar-winning documentarian fights for honorable causes, but as he’s gotten more famous, his movies have become sloppier, lazier, and smugger, his preening self-regard drowning out his messages. As a result, I find myself agreeing with what he says but feeling deeply embarrassed to have my viewpoint expressed in such a slipshod, obnoxious manner. Nonetheless, I’m curious about his super-secret new film, which reportedly finds him proposing sardonic new invasion plans directly to the Pentagon. But is this another case of the director congratulating himself for shooting fish in a barrel? God, I hope not. 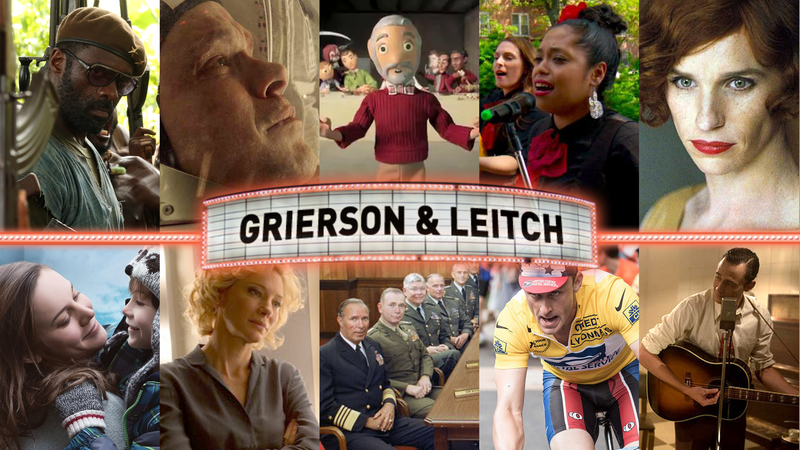 Grierson & Leitch is a regular column about the movies. Follow us on Twitter at @griersonleitch.